Leake vs Cole: M's 5-2! You can play in major-league baseball without being able to hit 98 mph fastballs. I would argue that it’s more usual to do so than not; hence Edwin Diaz. 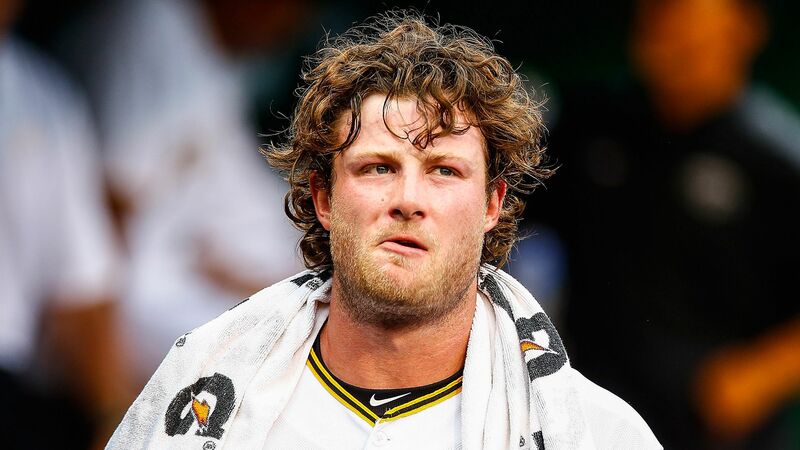 However, this asterisk to the ML resume requirements seem to matter little when you are "Mitch Hot"; he got a Gerrit Cole 98-er and pulled it down the LF line to tie this particular baseball game -- taking it from a predictable 2-0 Astros lead to a weird 2-2 tie in strange circumstances. Even more surprisingly, the Mariners wound up this far from going ahead 4-2 in the 6th inning and as the ball sailed through the air, he was counting his outs until Twin Closer time. Then the ball caught in the webbing of Marisnick's glove, Dr. D clutched his chest again, and checked back into the hospital for his usual gown. 64 feet from a standing start to catching the liner in 3.9 seconds and Dr. D wailed in futility about the M's lost chance to save a split vs. the T-Rex and Allosaurus of 1-2 starters, Verlander and Cole. Truly the baseball pantheon laughs at the M's this month. But then in the top of the 8th, Span caught yet another 98 MPH Cole bullet on the barrel of his bat, lining it up the middle for a clean single. Since it followed Haniger's second double off Cole, this put the M's into a 1 out, 1st-and-3rd situation and only a Jean Segura sac fly away from Twin Closer territory and lit cigars all around. An HBP later, the M's were a Boomstick SF away. Boom fell behind 0-2 but worked it to 3-2 with bases loaded, fastball obvious. This was the result. And, according to the M's, the new-look hyper-sabermetric lineup lives to see another day. The Mariners scrounged seven hits, six of which again came from the first four slots in the order (and the other from Cameron Maybin). The result: two games against Justin Verlander and Gerrit Cole, and two wins. I mean whattaya want, babe. Matched Cole pitch for pitch, sort of, if you’re going by the scoreboard rather than by strikeouts and intimidation and the radar gun and girls are running and screaming and stuff like that. No, more seriously, he had the drop on his pitches going in through nine ground ball outs, including a couple of absolutely critical double plays. Lest we forget, the man does get a couple inches extra drop on almost every pitch he throws, and runs fourth in the league in ground ball percentage. Dr. D does enough complaining about the ump'ing when it goes to his detriment; once in a while he should mention it when it runs in his favor. Here's the strike zone plot for Leake and here's the one for Cole. Dr. D counts at least 4 pitches called strikes for Leake that ran outside by at least a FOOT ... for Cole, no such pitches by any means and several memorable little green squares well inside the strike zone at just the moments the Mariners need them. I think the uniforms definitely confused the home plate blue. Fell, deservedly of course, to the Angels by a 4-3 count. Leaving the M's within 2, with two left to play in Houston and then the big three-game series coming up with Oakland immediately after. Can the WC lead be far behind? LeBlanc vs Morton: M's 3-2! I like him a lot. He's a battler and he keeps you in games. He's given up more hits than any pitcher in the league but when he gets going he wears you down with ground balls. Go look at his May and June game charts; He had a run where in 8 of 9 starts he had more GB's than FB's. He followed that up with two starts where he allowed one more FB than GB, then ran off 4 more where GB's dominated. Bulldog Maddux used to do stuff like that. He's also failed to go 5 innings in just 3 starts all season. If 5/2 or 6/3 is the modern Quality Start, then he's done it 16 times in 23 starts. Healy has hit 93 in OPS+. Heck, he may get to 89 before Cano gets here. He's 6 for his last 52 by my count. Really, Servais should have rolled Vogs out there for several games in a row just to see if he was an improvement. Somebody please get the scoop on why the suits hate Vogelbach so much. In July he hit .383-.493-.583. Really. That's not hot enough to get some MLB starts? The originator of Billy Ball let Healy go, I will remind you. Why? He doesn't walk. Servais and Dipoto ramble about the value of CtZ but don't really apply it on a day to day level. Healy has had 391 PA this season, he's walked 15 times. Vogs has has 79 and walked 11 times. He's BB-ing in nearly 20% of his AAA PA's. OK, I know he has limits but isn't the point of AAA to see who's got MLB skills? Well, I suppose it is now moot, with Cano about here, but all the same! We were terrible offensively in July, a bat at 1B wouldn't have been bad. Or at least a several game roll of the dice. Anybody ever see the movie "Slapshot?" Did Vogs bring his race cars like the Hanson brothers? Kyle Seager must be the poster child for the shift. It has impacted him nearly across the board. Sure, he's on track for a career low BA , but where you can really see the impact of the shift is in other numbers. For example, from '11-'16 his BABIP never dipped below .278 and never rose above .303 (which was a partial rookie year). He lived at .290. Then last season it fell to .262 and this year it is at .252. He's on track for a career low in BB's and a career high in K's. His career Eye was .46 but has crashed to .27 this season. Pitchers have changed their strategy to take advantage of the shift. Last season his BA dropped 20 pts over the previous 3 seasons and it has dropped 20 more pts this season. There are AB's where any butcher-boy slap at the ball down the left side is an automatic single but I don't see him trying to adjust. It is entirely possible that the new Seager is a sort of .240/26 HR/100 OPS bat. There is value there, for sure.....but that's just not the heyday Seager of '14-'16. Gordon: His current season is almost a mirror image of his dismal (at the plate) '16 season. His '15 and '17 seasons were both years in which he hit well over .300, however. Can somebody just go change the calendar in his locker, switching it to an even-numbered year? Regarding Vogs, do you recall if he was shifted like Seager? Do the suits maybe want to limit the overall shifting damage To our lineup? It seems to me that after his hot start, the shift was really affecting his output. Someone recently relayed to me a conversation a left handed hitter similar to Seags had with a journalist in which he was being criticized for not adjusting his approach against the shift more often - bunting, etc.. The player said he isn’t just being bullheaded. Rather, he looked at the situation sabermetically, read and analysed the numbers, and came to the unmistakable conclusion that the best and most productive thing he could do was continue to hit like he always did, and fight the shift head on. I wonder if anyone has seen this article and could link to it. That is good stuff, Rick. However, I'm not sure it works entirely that way, Sabermetrically. It seems like such reasoning hangs on a thread that says, "A static number of homers is worth a significant loss in singles." Seager is on pace for a 38-0-27 2B-3B-HR line....right on track with what he's done for 3 seasons running. But look at this: This is his total single and extra-base (1B-XB) hit numbers going back to 2012, his first full season: ('12) 98-56 ('13) 104-56 ('14) 102-56 ('15) 103-63 ('16) 97-69 ('17) 83-61 (Proj. '18) 76-65 . Notice the trend. For his career, Seager lived at 101 (+- 4) singles per year. He was incredibly consistent in that regard. But last year he lost 18 of them. This year he's projected to lose 7 more. He's lost nearly 1/4 of his singles. His XB numbers have remained flat (4 seasons running) so indications are that he is hitting the ball just as hard as he always did. It's just that he not getting nearly as many LD to RF singles as he once did. It would seem that the sabermetric key would be to take the singles to LF when you can and reduce the shift. 1 out of every 11 PAs for Seager results in an XB. That remains pretty consistent over his career. And that's what I meant when I said that this is the new normal for Seager. He's unlikely to become 40 HR guy, minus a roll of the PED dice. But it doesn't look like he's capable or desirous of taking advantage of the shift when possible. Opposing manager are winning the vs. Seager matchup. From '13-'16 he was a 124 OPS+ guy. Over the past two seasons he's been a 104 OPS+ guy. The shift has taken away 16% of his batting value. A focus on going the other way, something that takes more effort than smacking pitches to right, will likely (or possibly, if you prefer) to force the player to lose focus on looking for the right pitch to pull, and lead to a decrease in XBHs. It’s not like the HRs will remain static as the new approach limits number of pitches he’s stalking. If he’s changing his approac, he’s distracted at doing something he’s not good at. He needs to focus on what he is good at, or the success he has in doing what he’s good at will suffer. In short, he’s doing all he can to maintain those numbers. Changing his approach will make him even less effective than he currently is. If a bad bunter or ball chopper bunts or chops at more balls, his success rate will be bad, because he’s being asked to do something he’s not good at. The tradeoff: fewer opportunities to focus on what he excels at. And it’s not like nobody is guarding the left side. It’ll take a lot of success to get a player or two to shade more left, and frankly, the opposition has taken it all into account and like their chances to leave their shift just the way it is. So the Seager bet is that by using LF intentionally ("Ichiro-ing" it, as it were) it will reduce his effectiveness in all the other things he does. But here's the rub....the shift has already done that. He doesn't walk, he K's more and he doesn't get base knocks. What he does is still hit 2B's and HR's at the rate he always has. His bet is that every 11 times he tries to go to LF, he loses an XB hit. 41% of his XB hits fly over the wall. Something like every 27 times he's come to the plate he hits a homerun. If he tries to "Ichiro-it" to LF 27 times he loses a homerun and not quite 1.5 doubles. I think I have that right. That seems to be his belief system. He doesn't want to give up that XB chance, even if it means losing 20% of his singles and 20% of his walks. Not a perfect description, but in the ball park. Elevate and pull as the Gospel according to St. Kyle. It is the modern game, after all. If Seager maintains his XBH rate, while Cano, Cruz, Haniger and Segura get on base, if effectiveness increases even if his XBHs remain static. If he focuses on OBP, he’s counting on the occasional Heal—Zunino-whomever bomb to produce, along with, uh, baserunning skills of course. Yes, the shift has reduced his overall effectiveness already - granted. That’s life. But like Doc says, those HRs and 2bls are something you can take to the bank to cover the loan for more OBP dudes to increase value per XBH.